How to ensure impact with blogging! The idea behind children blogging is simple - give them a platform to write for a real audience and this provides a purpose to write. When children have a purpose, it impacts on the quality of writing. 100 Word Challenge - Simply an amazing way to promote and showcase children's writing. Each week a prompt is given which the children need to write a blog post of 100 words about. The post is then linked from your blog to the 100wc.net website where it can be seen by the thousands of schools, teachers and children that visit the site each week. A group of willing volunteers have the busy job of trying to comment on as many posts as possible. As the site now gets around 1000 entries a week they are crying out for people to help comment on children's work. I think a lot of Secondary school teachers should encourage their students to comment as it is a great way to really promote themselves as responsible digital citizens. As a class we sometimes will do the 100 word challenge as a lesson, look at children's examples from around the world before having a go at writing their own. Quadblogging - Created by David Mitchell, this termly project groups your blog with another 3 schools from around the world to create your quad. The idea is to then have a focus school for that week with the other schools visiting and commenting on work on the site. A really great way to ensure children's writing is seen and commented on and also teach children responsible use of the internet. Lend me your Literacy - If you are not blogging but want a way to have your work seen and commented on, Lend me your Literacy can provide that service. They will come and deliver a day with a class, publish all their work on their site and promote it so it receives comments from people all around the world. Within the package they will also publish other examples of work throughout the year to continue to inspire children to produce quality work. Using these three tools will definitely build an audience and light up the globe on your blog. However they can't guarantee that every post that the children write will have feedback and be equally valued. It is comments from people outside of the classroom that has the biggest impact on children's work. Therefore creating a way to guarantee comments will create an encouraging environment throughout the school. This idea originally came to me from Mr Osler and Miss Gardner who had the idea of recruiting a group of parents to ensure every child's work is commented on. I thought this was a great idea however for maximum impact, I didn't want the children to suspect it was parents commenting, instead other special visitors who were 'experts' at writing. And so the "Guardians of Grammar," was created. The real identities of the GoG will remain anonymous, they are only known as their literacy superhero alter egos. Their mission, to leave no posts on the Davyhulme Primary Blogs without constructive and useful feedback. How we set it up - A simple Google Form was set up for parents to sign up with an email. I then created log ins for each parent so they can comment under their new superhero identity. Wonder WhatHappens aka Paige Turner. Doctor DotDotDot aka Eric Ellipsis. To make this even better I sent all the superheroes this link for them to create their own SuperHero Avatar - Click Here. 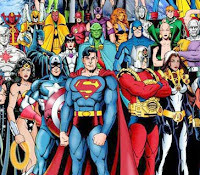 It was important to inform the children about these superheroes who were now visiting our blog. Where were they from? Who are they? Why were they visiting our blog? These questions filled the children with excitement to get writing. When it was revealed that these superheroes find excellent pieces of writing to reward and comment on. This has filled the children with enthusiasm to have their writing seen and commented on by real superheroes! As for building connections with parents and involving them in children's learning this has been a great tool to use. By all means try it! But make sure that the parents can be trustworthy enough to keep the GoG a secret! Thank you SO muchfor this! Not only the mention but also the huge plug for volunteers. I LOVE Super Heroes & with your permission will send to all schools who take part in 100WC to set it up!. Love the sound of this. In order for their superhero avatar to show when they comment do they need to set up an account? Writing for a real audience! Pic Collage - More than just making posters!